It’s hard to make informed decisions and drive profitable change when you aren’t able to use technology to gain a clear insight. And having to rely on a technical specialist to manage your reports delays access to the data you need, and increases resource drain. Microsoft Dynamics ERP solutions were built to collect data, not report on it. There’s no way you have the time or inclination to memorize the thousands of tables in your ERP system in order to get the right numbers, not to mention formatting them in a consumable, visually appealing way. You’re not the only one that needs to make data-driven decisions. You all need to ensure you're using the same set of numbers, and that you can see them in a way that quickly identifies the answers to your questions. Build a business dashboard that summarizes the numbers you want – in a format that’s easy to digest – in about 5 minutes. 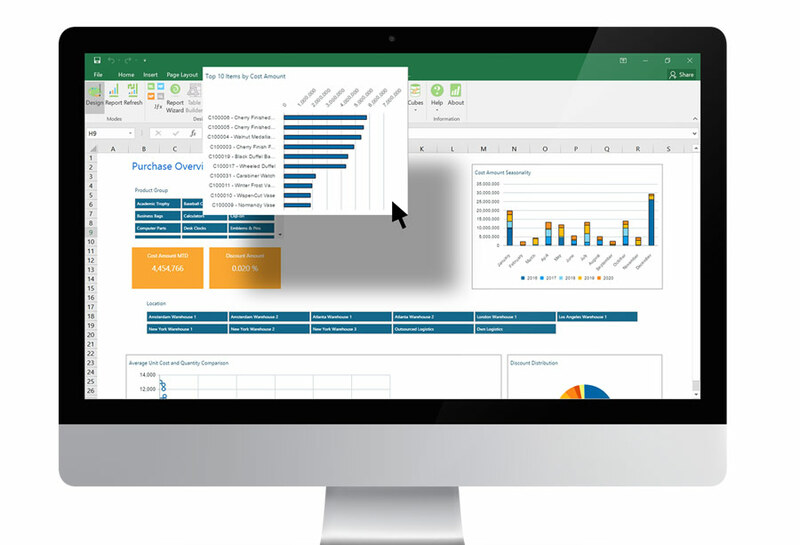 Create dashboards directly inside the most widely-used analysis tool in the world – Excel. 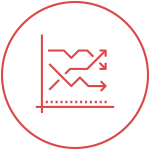 Analyze metrics without having to know the underlying data structure. 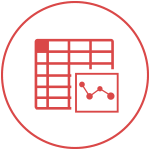 Drag and drop the data you want to analyze and create sophisticated BI dashboards directly in Excel with minimal effort. 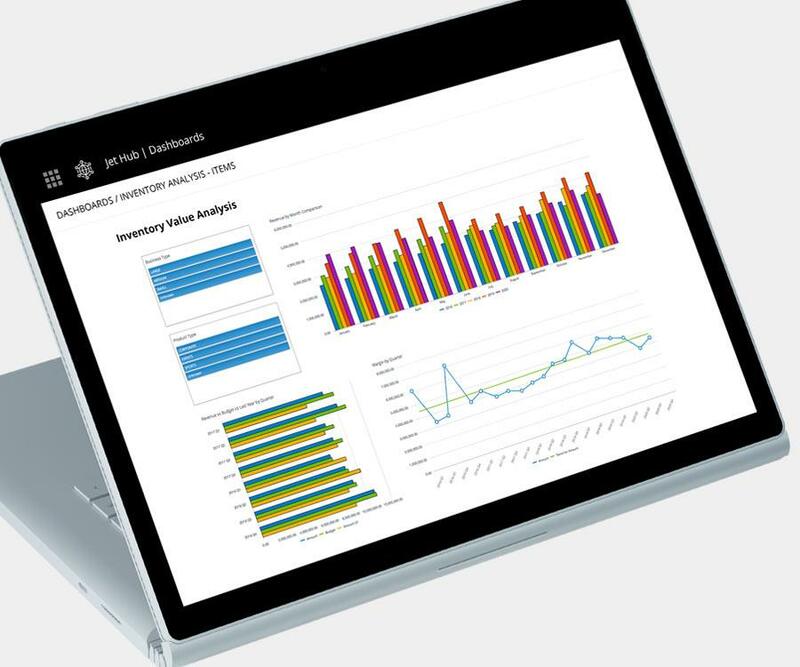 See how quick and easy it is to create powerful, rich BI dashboards by watching the webinar recording: The 5-Minute Dashboard. 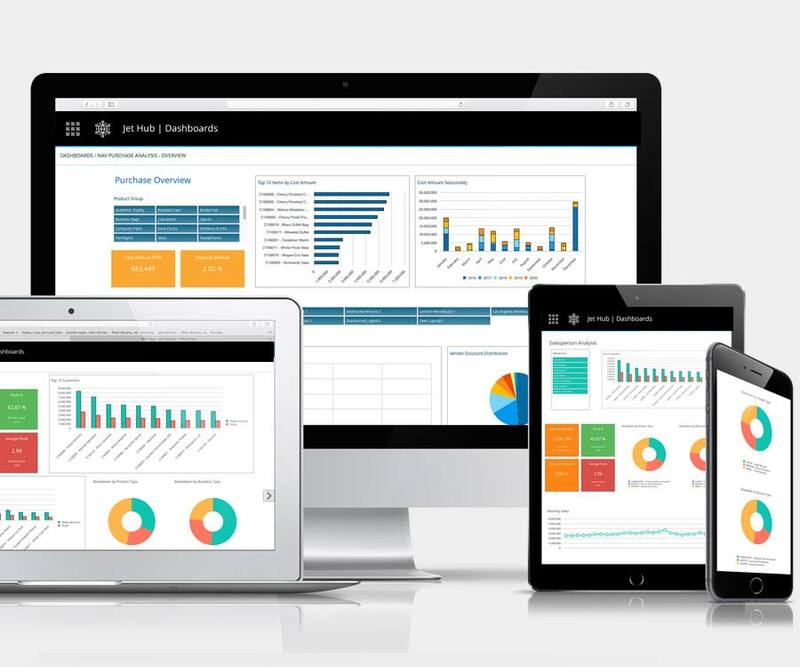 Empower users to make better decisions, faster, on any device. 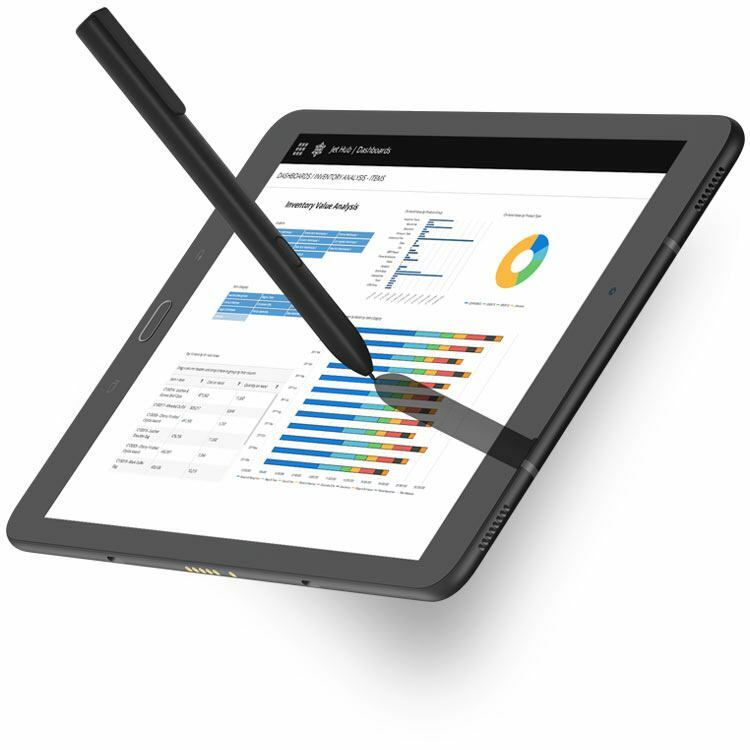 See trends in your Key Performance Indicators and instantly group and filter data to identify the causes from virtually any device with a web browser. Build confidence, insight, and trust to improve team output. Publish and share dashboards that are built from accurate, governed data. Schedule updates at regular intervals to ensure your team is always looking at the right information, and the same version of the truth, to make key business decisions. Users don’t have to choose between accuracy and adaptability. Dashboards are only as good as the back end they are built on. Luckily, the Jet Analytics back end is robust, intuitive and flexible. 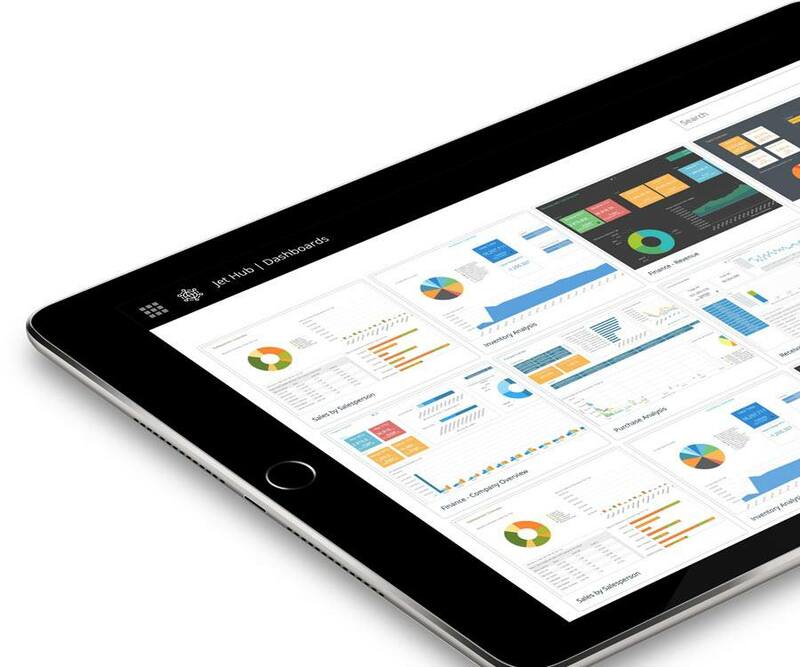 View data inside of Excel, on the web, through mobile devices, in Power BI and more – the options are almost limitless. Jet isn’t just a reporting add-on that works with Dynamics ERP, it’s a reporting add-on that was MADE for Dynamics ERP – we work directly with Microsoft. Jet Global solutions are tested and repeatedly implemented with AX, NAV and GP to work right out of the box. We know what we’re doing because we know everything about your solution – inside and out! Jet was designed to get you up and running in hours, not weeks or months. 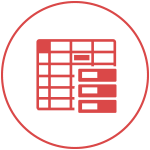 Pre-built reports, dashboards, cubes, automated data warehousing and an intuitive design means rapid time-to-value. And by using the familiar Excel user interface, we reduce the time it takes for your staff to maximize productivity. This isn’t your typical software project – it’s fast, easy and effective. At Jet Global, we love what we do. In fact, you could say we’re data geeks. We know that simply giving you tools isn’t the way to truly improve your business. That’s why we have full support and training resources, including an extensive knowledge base and an active community forum, designed to get your team up to speed quickly. Are You Building the Wrong KPIs? One of the benefits of business intelligence dashboards is that you can monitor your Key Performance Indicators. Every business should have them. But are you doing it right? Jet BI Dashboards Work – Our User Roster is 219,150 and Growing!